My Dream has always been to gift cancer patients and those going through stressful life circumstances with "The Magic Mirror" CD. Pilot study research has shown this 23 minute solo harp CD relaxes the body, reduces anxiety and supports brainwave and immune system function. I listened to this CD every day during both of my breast cancer experiences and know how it helped me. Now you can help others by sharing this CD with them. Celebration Donation CD Final Count: 215!!! I am very glad that Amy introduced me to her solo harp music. I enjoyed the calming effect the music has without being distracting. Patients and staff both benefit from the soothing sound of the harp; it promotes a sense of peace and helps with stress and anxiety reduction. Amy, thank you for sharing your music with me and giving me the opportunity to share with my patients. My commitment to having this CD given to cancer patients is a personal dream and I now know from my own experience how important and valuable this music can be for everyone going through chemotherapy. Any money received after May 26th will sponsor CDs to The Cancer Support Community of Greater St. Louis to share with patients throughout the St. Louis area. Friends and Family who have sponsored CDs...thank you!! June 16 - Members of the Alton/Godfrey Community sponsored 38 CDs to Alton Memorial Hospital's Cancer Center during "Summer in the Garden" event. 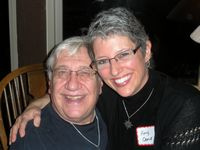 "Cancer Support Community's July/Aug/Sep Newsletter, pg 2: MEET Amy Camie"